Over all inspection and audit of the air filtration systems to determine the visible and physical general health of the system. Technical evaluation of the air filtration systems by way of testing for compliance on various parameters. Validation Type: Dust particle, Temp, RH, DP measurement. We undertake complete validation documentation of clean room and clean room equipments. Patrons can avail from us Clean Room Validation, which is timely executed under the astute guidance of our team mates who work in tandem with the industry laid standards and norms. In addition to this, our experts make use of superior grade raw material that is obtained from authentic vendors. Moreover, these services can be availed from us at competitive prices. - Our Cleanroom Validation methods exactly comply with ISO 14644 part 3 and as per NEBB requirements. It also meets the requirements of other Regulatory bodies like GMP, GLP, USFDA, and so many other Industry-Specific Standards. 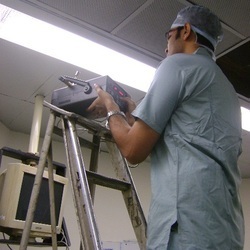 We are highly dedicated in rendering highest quality range of Clean Room Validation Services to our clients.